Click here for the PDF version of this report. Click here for the article in The Jerusalem Post, “NGO Monitor Claims Anti-Israel Bias at UK Medical Journal ‘Lancet'”. This NGO Monitor study focuses on The Lancet medical journal and its treatment of Palestinian public health and related issues in 2001-2014, and the comparison of the scientific and political emphasis in different frameworks. The study’s research and analysis were divided into two periods: 2001-2008 (prior to the founding of the Lancet-Palestinian Health Alliance – LPHA) and 2009-2014 (following the founding of LPHA). As a scientific medical journal, The Lancet is in a unique position to play a constructive and positive role in not only improving the healthcare of Palestinians in the West Bank and Gaza, but also contributing to the prospects of peace by building bridges between the Israeli and Palestinian medical communities. In contrast, by taking a highly politicized course in the Israeli-Palestinian conflict, The Lancet has ostracized, and to a large extent, demonized Israel and the Israeli medical community. During this period (2001-2014) Palestinian health care items published by The Lancet were 64.7% political opinion or commentary while 35.3% were medical. During the same period The Lancet published a total of 43 items on Israeli health care and related issues. Of these, 25.6% were political opinion or commentary and 74.4% were medical. This indicates that the creation of the LPHA was a likely causative factor resulting in a nearly six fold increase in the average annual number of political opinion or commentary items (20.8/year vs. 3.6/year) published in The Lancet. Israeli policy towards the West Bank and Gaza is consistently assigned causality for Palestinian health deficiencies and presented as the most critical issue to be examined. There is limited discussion of the dysfunctional Palestinian health infrastructure, as well as the impact of Palestinian factional disputes, mismanagement, and corruption. Under Horton’s editorship, The Lancet has become a recurrent platform for advocates of the Palestinian national cause. He also steered The Lancet toward partnering with a number of politicized pro-Palestinian NGOs, particularly the UK-based Medical Aid for Palestinians (MAP). Horton was also a key player in the formation of the highly politicized Lancet-Palestinian Health Alliance (LPHA), of which MAP is also a key participant. In public statements, Horton has attacked Israel and Israeli institutions, defamed the Israel Medical Association, and called for a global “uprising” against Israel. The Gaza “open letter” triggered a storm in the medical community and in Israel. That two of the letter’s authors promoted a neo-Nazi video and a third made antisemitic comments in Horton’s presence, underscores the urgent need to address the problems at The Lancet. To date, Horton has not apologized for the publishing of this letter, and has refused to retract it from The Lancet’s web site. Reform and re-vision the LPHA to remove its politically polarizing consequences. Disassociate itself from the NGO Medical Aid for Palestinians and end MAP’s role within the LPHA framework. Apologize for, retract, and publicly remove the “Open Letter for the People of Gaza” where it is still available on the home page of The Lancet’s website; Further, Dr. Horton should personally apologize for and retract his own hostile comments against Israel and the Israeli medical community. Initiate an open review of articles related to Israel published since 1 January 2001 to determine whether and which articles fail to meet established scientific standards, and to issue retractions where appropriate. In 2013, NGO Monitor published NGO Malpractice: The Political Abuse of Medicine, Morality, and Science. The medical community, broadly defined, is morally committed to the highest standards of professionalism and universality, treating all those in need irrespective of any other factor. In contrast, and in violation of these moral principles, a number of highly influential non-governmental organizations (NGOs), claiming medical mandates and active in the framework of the Arab-Israeli conflict have politicized medicine, using it as a means to demonize Israel and discriminate against Israelis. The monograph demonstrates that renowned UK medical journal The Lancet, in particular, publishes and often gives prominence to officials of these NGOs or to articles based on their reports, providing a scientific veneer to NGO political claims and biases. Under the editorship of Dr. Richard Horton, The Lancet frequently advocates for the Palestinian national cause, partnering with a number of pro-Palestinian NGOs and promoting the highly politicized Lancet-Palestinian Health Alliance (LPHA), “a loose network of health researchers committed to illuminating the conditions under which Palestinians live today.”1. The LPHA was launched in 2009 as a partnership between The Lancet, the Institute of Community and Public Health at Birzeit University, and the NGO “Medical Aid for Palestinians” (MAP). The LPHA series has been published annually in The Lancet since 2009 and has served as the main mechanism for the promotion of NGO political agendas in the pages of The Lancet. NGO Monitor researchers’ subsequently uncovered emails circulated by two of the Gaza letter’s main authors (Drs. Paola Manduca and Swee Ang Chai) promoting a virulent antisemitic video by American neo-Nazi David Duke. Major mainstream media coverage, beginning in Britain, followed. Long before the Gaza letter, these authors had been published in the Lancet, thereby also promoting the agendas of the political NGOs with which they are associated. Paula Manduca, for example, is prominent in the New Weapons Committee. This NGO has made entirely fictitious claims that Israel “experimented” with new weapons in Gaza and Lebanon. And Swee Ang Chai is a founder of Medical Aid for Palestinians (MAP), which is very active in promoting the Palestinian political cause and advancing campaigns targeting Israel. As documented by NGO Monitor, the media in general, including professional journals, acts as a force multiplier and facilitator for medical NGOs and their agendas. Beyond simply providing this service, The Lancet has also presented numerous articles involving Israeli-Palestinian issues that are given the facade of scientific credibility in an editorial procedure that is not transparent and may or may not include standard blind peer review and evaluation processes. This study examines in detail the publishing history of The Lancet as it relates to coverage of Palestinian and Israeli health care and related issues. We begin by outlining our methodology, including the identification of key words used to systematically categorize the articles. NGO Monitor researchers examined and evaluated all available items (articles, editorials, and correspondence) published by The Lancet covering Palestinian health care and related issues during the period January 1, 2001 to the present.2 A keyword search used the following: “Palestine,” “Palestinian,” West Bank,” and “Gaza” through the “abstract title, abstract or keyword” search function of The Lancet’s web site. NGO Monitor researchers also examined and evaluated all available items during the same period (2001-2014) that focused solely on Israeli health care and related issues. The items were chosen by searching the keywords “Israel” and “Israeli” through the “abstract title, abstract or keyword” search function of The Lancet’s website. 1. For purposes of this study the word “item” refers to articles, editorials, and correspondence. a. Political commentary or news containing no scientific research. b. Content that was clearly and overwhelmingly political in focus, leading to conclusions heavily influenced by political considerations and premises. c. Causal claims (such as Israel policies) for health deficiencies faced by Palestinians without examining or considering other publicly available evidence of other potential causes. d. Politically charged terms, such as accusations of “war crimes,” “apartheid,” “aggression,” and “massacres,” which go beyond the purview of medical analysis. 3. An item was defined as being “medical” if the exclusive or primary focus was a report on medical and/or scientific research. As noted, NGO Monitor evaluated all available items published by The Lancet covering Palestinian health care and related issues during the period January 1, 2001 to the present. The findings are directly below, and detailed results are found in the tables beginning on page 13. 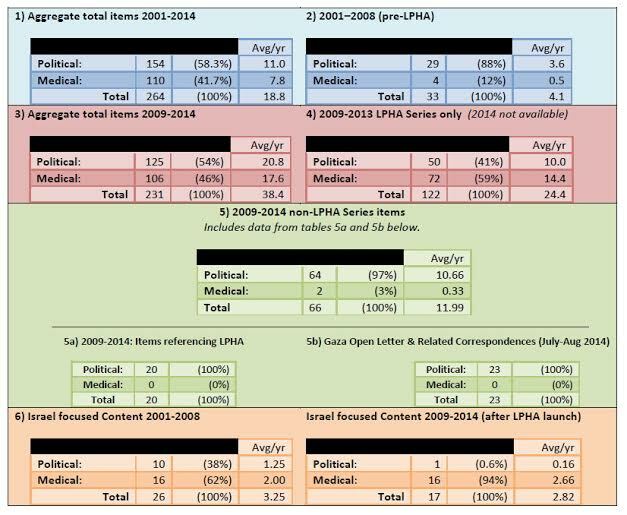 In 2009-2014 (from launch of LPHA to present), The Lancet published an aggregate total of 231 items of which 125 (54%) are political opinion or commentary and 106 (46%) are medical, an annual average of 20.8 political opinion or commentary and 17.6 medical. Medical Aid For Palestinians (MAP) is a major UK-based NGO that operates medical clinics in the Palestinian Authority, Gaza, and Lebanon. A number of senior British public figures serve on its board. MAP promotes a politicized, divisive, anti-Israel narrative through its lobbying of the British Parliament and has repeatedly joined with other political advocacy NGOs to lobby the European Union and other international actors to sanction Israel. (For details, see the NGO Monitor website). MAP was a partner with The Lancet in building the LPHA. MAP has been a consistent organizational contributor to the LPHA since its onset in 2009 and remained a funding partner in 2010, 2011, 2012 and 2013. MAP government donors include the EU, UK, Ireland (via Irish Aid and Trocaire), Australia (AusAid), UNICEF, and others. Under Richard Horton’s editorship, The Lancet has become a recurrent platform for advocates of the Palestinian national cause. He also steered The Lancet toward partnering with a number of pro-Palestinian NGOs, particularly the UK-based Medical Aid for Palestinians (MAP). Horton was also a key player in the formation of the highly politicized Lancet-Palestinian Health Alliance (LPHA), of which MAP is also a key participant. Horton also attacked the Israel Medical Association, falsely accusing one of the IMA officers as having “called Palestinians animals” at a 2007 closed-door meeting in Israel. Horton claimed that this made him realize he could not find common ground with the Israeli medical establishment. And this is what you’ll see if you have 24-hour cameras in a Palestinian village, you will see when a child falls ill with pneumonia the mother will not be able to get access to antibiotics. You will see when a man injures himself, perhaps fractures an arm or a leg, he will not have access to trauma care. You will see when a young family, a young couple gets married, they will not be able to build a house because they will have to get a permit to build a house which will be denied them. You will see that a village that wants to build a clinic or a school will be denied the possibility of building a clinic or a school. You will see a woman who is pregnant unable to get access to maternity care. You will see all of these things. And when the world sees the reality of Palestinian society, right now, today, this second, there will be an uprising. And there will be shame and horribles (sic) on Israel. Dr. Swee Ang Chai is the founder of Medical Aid for Palestinians (MAP); her current position is “honorary Patron.” She remains active in MAP, including participating in MAP panels (2012), profiles in MAP’s newsletter (2014) and briefing reports (2012), and MAP campaigns (2014). In the 2014 Gaza war, Ang “responded to the call for surgeons to go to Gaza to help treat the wounded on behalf of a MAP initiative,” but was denied entry into Israel. Swee Ang discussed her denial of entry in an interview with Global Research, an anti-globalization NGO. Swee Ang was a co-author of the July 23, 2014 “Open Letter for the People in Gaza,” published in The Lancet. Other primary signatories included Manduca, Iain Chalmers, Derek Summerfield, and Mads Gilbert. Each has made extreme anti-Israel statements and, in some cases, made overtly antisemitic ones or promoted antisemitic materials. In its 2013 annual report MAP thanked Manduca for being a partner and/or supporter. In 2014 Manduca publically raised funds for MAP. Manduca posted a number of antisemitic emails to the Italian Google group Sempre Contro la Guerra. She posted an article by Paul Larudee with the subject “israel and parassites” (sic). The article’s main theme is that Israel, through the American Jewish community, is a “parasite” feeding off the host/victim nation – the United States – by controlling key U.S. institutions. This “Jew as parasite” theme was prominent in Nazi and other antisemitic ideology. Sir Iain Chalmers was a co-signer of the Gaza “Open Letter.” He is co-founder of the Cochrane Collaboration headquartered at Oxford University. I was asked to write a commentary for The Lancet after the Cast Lead attack. I ended it by saying a self-defined Jewish state, Jewish state, now controls the lives of almost as many non-Jews as it does of Jews. What will that Jewish state, do with the six million, it’s an interesting figure, the six million, non-Jews whose lives it controls. The Lancet has published three of Chalmers’ articles in connection with the LPHA in 2009 and 2012 and several other articles on Palestinian issues. Chalmers also presented research at the 2013 LPHA publication release hosted by MAP. In the online LPHA series, as well as at the 2013 LPHA research publication launch sponsored by MAP, Horton describes Summerfield as being the catalyst for the LPHA. Horton said the LPHA “started off with Derek Summerfield… [who] encouraged me over the course of many years to take an interest in the Palestinian territory.” Horton further describes how Summerfield coordinated a meeting between Horton and Prof. Rita Giacaman at Birzeit University, which led to the founding of the LPHA. Giacaman is a member of the LPHA steering committee and since 2009 has co-authored 21 articles in the Lancet, 17 of which pertain to the LPHA. Summerfield spoke at a September 2014 MAP event in the wake of the conflict between Israel and Hamas. In October 2014, in response to growing protests, Horton accespted an invitation to Rambam Hospital in Israel where he spoke to a gathering of Israeli physicians. He “deeply, deeply regret the completely unnecessary polarization that publication of the letter” caused. While he strongly condemned Swee Ang’s promotion of the Duke video, he nonetheless refused to apologize for publishing the letter or remove the anti-Israel material and articles from The Lancet website, as demanded by many medical professionals. Horton’s observation on the need for editorial vigilance regarding how potentially divisive political issues are discussed is a good foundation to begin a reform of the LPHA. Its highly politicized nature, mostly blaming Israel alone for Palestinian health care problems, could lead researchers into making wrong conclusions based on the exigencies of political whims. Epidemiologic and public health studies should avoid basing conclusions on inaccurate, incomplete or politically tainted data, and it is the responsibility of medical journal’s editor to ensure the presentation of such studies is as free from a political agenda as possible. This is underscored all the more when that political agenda is that of one side in a longstanding conflict between two national movements. The danger becomes acute when a medical/scientific journal is recruited into acting as a mouthpiece for a given nationalist cause. This is what appears to have happened with The Lancet and the LPHA. Horton’s promise to institute a partnership with Israeli medical professionals to produce a series on the Israeli health and medical research system could become an important first step toward moving the LPHA from its politically polarizing fallouts. Conversely, if the Lancet-Israeli partnership proposal fails to take these factors into consideration, it will be seen as an attempt to put a bandage on the situation by offering a balance to the LPHA. That would not solve the current controversy, and worse it could negatively impact health care for both Palestinians and Israelis alike. It would be far more beneficial to both Palestinians and Israelis for The Lancet to serve as a truly open bridge between the Israeli and Palestinian medical communities. In its current form the LPHA prevents this from happening. The refusal by Horton and The Lancet’s parent company Reed Elsevier, to fully repudiate the Gaza open letter, retract the letter from The Lancet’s website, and apologize for its publication contributes to the ongoing atmosphere of distrust between the Israeli medical community and The Lancet. Further, this situation has contributed to the alienation from The Lancet by physicians internationally. Due to The Lancet’s position, a number of prominent doctors have refused invitations from The Lancet to review or submit papers. The resignation by a senior Israeli scientist from an advisory board of The Lancet is another casualty of the ongoing situation. This breakdown in trust and communications within the world medical community harms the advance of medicine. A major first step to reforming the LPHA would be for The Lancet to disassociate itself from Medical Aid for Palestinians and end MAP’s role within the LPHA framework. Apologize for, retract, and publicly remove the “Open Letter for the People in Gaza” from its website. Further, Dr. Horton should personally apologize for and retract his own hostile comments against Israel such as calling for a global “uprising” and “shame and horribles” against Israel, and the unfounded allegations he made against the Israel Medical Association. Initiate an open review of The Lancet articles related to Israel published since 1 January 2001 to determine whether and which articles fail to meet established scientific standards, and to issue retractions where appropriate. The LPHA series for 2014 has not yet been published. Roy, Sara (2013-11-10). Hamas and Civil Society in Gaza: Engaging the Islamist Social Sector (Princeton Studies in Muslim Politics) (p. 140). Princeton University Press. Kindle Edition. The BBC describes how funds from Interpal have “helped build up Hamas into what it is today by most of them being sent to Islamic (partner) charities in Gaza and the West Bank, a number of which promoted Hamas’ ideology.” In 2014, Manduca raised money for Interpal as well, sending out an appeal to the Sempre Contro la Guerra group. NGO Monitors research demonstrates that, under Richard Hortons editorship, The Lancet has become a platform for intense political propaganda, particularly targeting Israel.